All contractor license classifications must take the Business and Law exam in addition to any required trade-specific exam. Be a United States citizen or a legal alien-must provide proof of being a legal alien. Never have been convicted of a disqualifying offense. 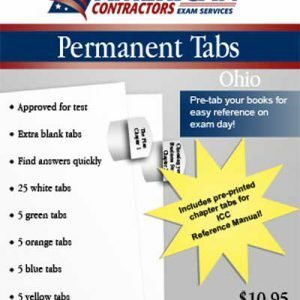 The Ohio Business and Law exam is required to be passed in order to obtain a Contractors License. This Business and Law course coordinates with the Ohio Plumbing Contractor seminar and should be done concurrently. The references listed below are permitted to be taken into the examination. These references may be tabbed (with a permanent index tab) and highlighted. They are available for purchase from our online bookstore or by calling 800-992-1910. As of 8/24/17, This examination is OPEN BOOK. The reference is provided in the testing center. No highlighting or notes of any sort may be made in the book during the exam. You may NOT use your own copy. 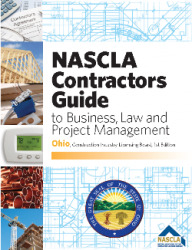 Ohio Contractors Guide to Business, Law and Project Management, 2nd Ed. The exam is administered by PSI. It is an open-book timed test with 50 questions and a 2-hour time limit. A score of 70% is required to pass. The exam fee is 69.00 per exam. As of 8/24/17, This examination is OPEN BOOK. The following reference is provided in the testing center. No highlighting or notes of any sort may be made in the book during the exam. You may NOT use your own copy. The Business and Law exam is required for all trade classifications. If you decide to obtain an additional trade license at a later date, you only have to take the Business and Law exam once every three years. American Contractors Exam Services holds a Ohio Business Law Seminar that coincides with each trade exam seminar to prepare individuals for both exams that need to be passed. American Contractors has been holding Seminars to help contractors pass their exam for over 22 years.